Living the spiritual path … on the ground, in the heart, for the other. Listeners are safely taken to the higher dimensions for healing and the elevation of consciousness through the magic of the deep trance journey. A six-page booklet includes instructions and preparatory guidelines to give you the deepest possible healing from the journeys. The journeys can be taken with that simple guidance or in conjunction with the spiritual path described in Awakening and Healing the Rainbow Body and the guidance for that path contained in the Awakening and Healing Companion Guide to Self-Mastery (this CD is required to successfully begin that work). Track One: The Journey to Alcyone takes the listener into the Fourth Dimension (the astral, mind or soul) to change core beliefs that no longer serve him/her. It effectively shifts their assemblage point to a new, more supportive reality. Use this journey to accelerate your spiritual growth. Track Two: Pachamama's Child is a delightful trip into Fairy World providing joyful ways to release negative emotions, thoughts and heartache. The listener returns with a powerful light in their heart and a renewed commitment to their spiritual work. It is a wonderful way to recapitulate your day and can be the first way children learn to do that exercise. Use this journey whenever you feel a bit down and out, just to relax, or to put you to sleep. 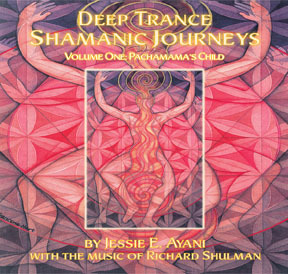 An exciting new modality in the field of self-healing, Jessie's voice and Richard Shulman's inspired music combine to create transcendent audio experiences. ISBN# 978-09648763-6-1, Total running time: 74 minutes 19 seconds.